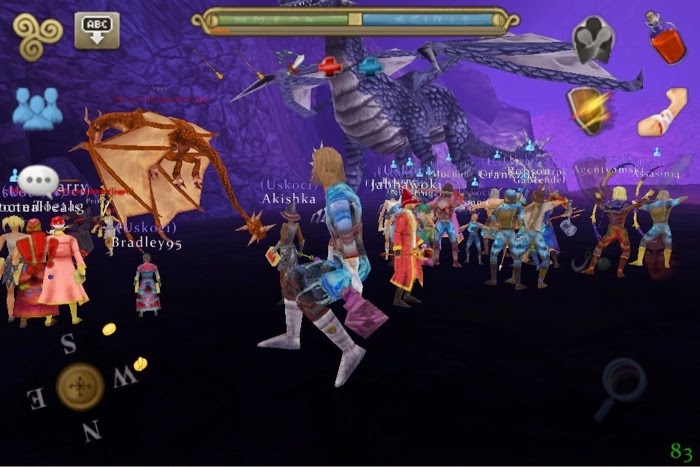 The Arawn server has a rich history that has been crafted over many years by clans and players that have slipped into legend. In this post I will tell about the course of events that started at the beginning of the game, which led us to where we are in the present day. This is Part 4 of the history of Arawn. At the beginning of Update 3, BadaBing members started tirelessly leveling using super knowledge elixirs to get to the top faster. Shortly after the update started Bubbles had to step down as chief and leave the game because of real life commitments. He handed to the role of chieftain over to Smellyunder, and following his lead many members raced to meet the level cap of 150. The double experience weekend during the 2012 Birthday Event, and gaining many pieces of Radiant Armor during the 2012 Summer Event helped cement BadaBing's place as the dominant clan... for a while. As BadaBing flourished, Serenity was floundering. They had lost many members due to people going inactive. Even the chief of Uskoci, Tomo, went inactive leaving control of the clan to his second in command Vinci. Under Vinci, Uskoci started aggressively recruiting new players and former Celts. As Uskoci started to grow in size, so did Serenity due to some players coming back after the update. They were also able to recruit some quality players, such as Teaweasel when Celts disbanded. 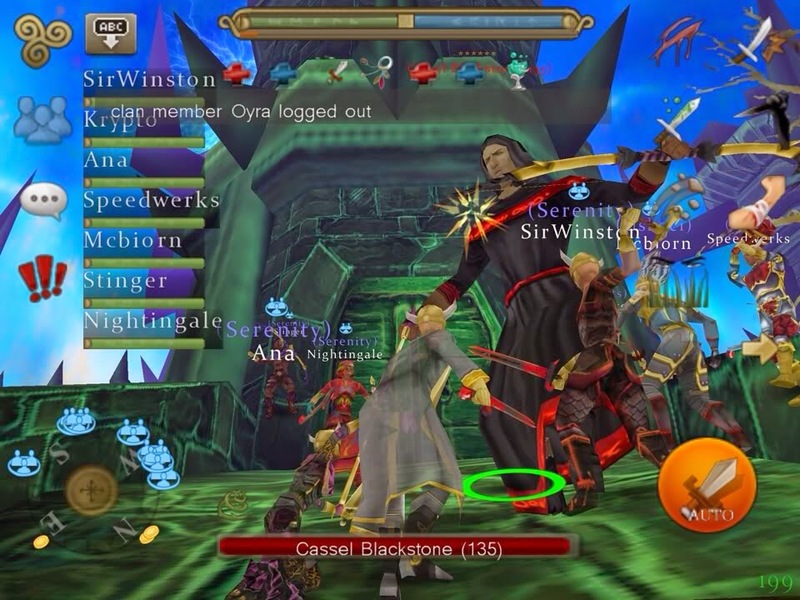 But by this time, BadaBing was already reaching the top levels, and were taking down the Blackstone bosses, and were getting ready to fight Aggragoth. There were some tensions within BadaBing as they grew. A personality clash occurred between a well respected clan leader KrazyKatz, and an up and coming druid named Model. She had drawn many friends to her, as she was very charismatic. However, for some reason KrazyKatz and Model hated each other. One night Model was talking to Goodies about her plan to break away from BadaBing and form a rival clan. Goodies was torn between his friendship between KrazyKatz and Model. His loyalty to BadaBing made him make a hard decision. Betraying his friend Model, he convinced her to break away from BadaBing before she had consolidated her power, which caused her to bring less people with her and mitigate the damage to BadaBing. Clan Power was formed with Model as the chief, along with Goodies, JcBeast, and Krypto. It lasted two days before failing due to internal struggles, which were stoked by Goodies. In the end, Goodies and JcBeast were allowed back into BadaBing. Model and Krypto were exiled. Model left the game, but would return for a short stint at the end of the Summer 2012 event to work with Uskoci out of clan. Krypto did this as well, but eventually took a break. He would return later, and would eventually rejoin BadaBing in 2015. At this time, BadaBing could defeat Aggragoth, but it took hours to do. To be able to defeat the dragon, BadaBing formed an alliance with Uskoci and Serenity that everyone would roll on the drops from Aggragoth. 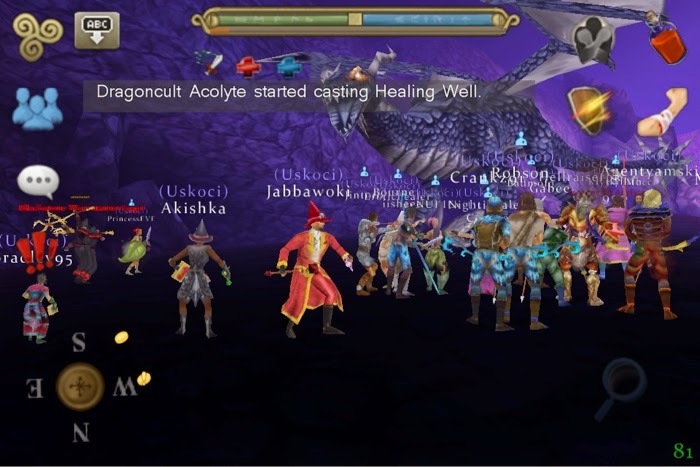 Together, Uskoci and BadaBing were able to defeat Aggragoth with Apoca as the main tank for BadaBing, and Jackos as the main tank for Uskoci. BadaBing was also helping out Serenity with crests and rings to get them better equipped to fight at the end game. In a series of bad luck for BadaBing, they lost many drops to Uskoci's lucky dice rolls. A few times Uskoci got all the drops from an Aggragoth kill, which angered BadaBing. This made BadaBing want to find a new method of distributing drops that would be more fair. Eventually they settled on two drops going to Uskoci/Serenity, and two to BadaBing. This arrangement did not last long. In the middle of Update 3, BadaBing was the most powerful clan, but Uskoci was the largest. During this time, Smellyunder handed over chief of BadaBing to a newer recruit that came from Serenity; a ranger named Phurious. In the beginning of Phurious' time as chief, BadaBing made a change that would help them survive against a larger Uskoci: they started using an online messaging app called Glassboard to alert clan members when help was needed. This helped them organize groups quickly when people were offline, allowing them to keep control of the summer dragon Ythair. However, it didn't always work. One time Uskoci was able to kill Ythair before BadaBing was able to organize, and it dropped a Radiant Earthstone Breastplate to Uskoci member Father/Iv; the rarest and most valuable of the Ythair drops. It was shared among the clan for a time, until it was sold to Teaweasel for a large amount of super knowledge elixirs. The elixirs were distributed among Uskoci clanmates, allowing them to level up quickly to challenge BadaBing who had many higher leveled characters. This was one of the major turning points for Uskoci as a clan. 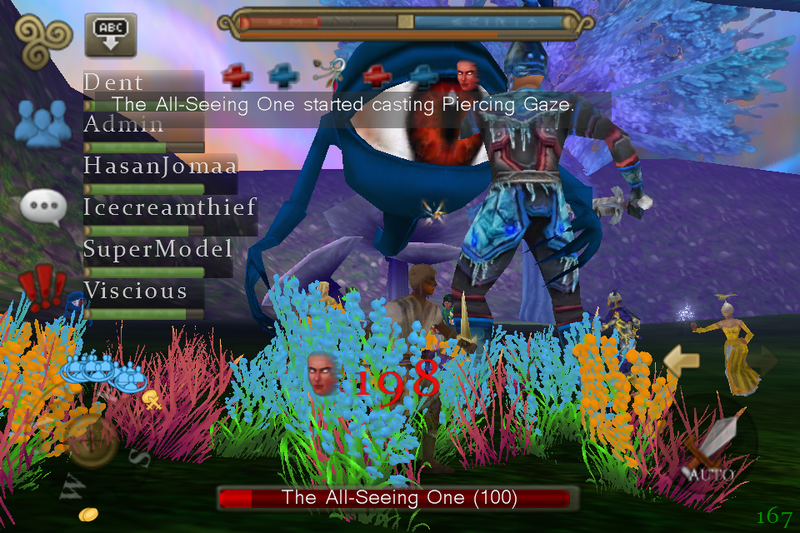 As Uskoci and Serenity teamed up and were able to defeat Aggragoth on their own now, through negotiations the clan leaders decided to forge a new pact: they would alternate Aggy kills.One of the reasons for creating a new agreement was tha BadaBing wanted to start using DKP to distribute its clan's drops, and the system was not well suited to being applied to a boss that is shared between clans. At this time, Serenity was not included in the agreement, as they had lost many members and could not defeat Aggy as a clan. In this agreement, Aggy would belong to one clan for 24 hours, and if that clan did not kill it then the dragon would belong to the other clan. However, one time Uskoci didn't kill Aggy in 24 hours and it went to BadaBing. The next Aggy there was confusion on who the dragon belonged to, because Uskoci said that Bada killed it and it was their turn, and Bada said they killed Uskoci's Aggy, and now it was a Bada Aggy. 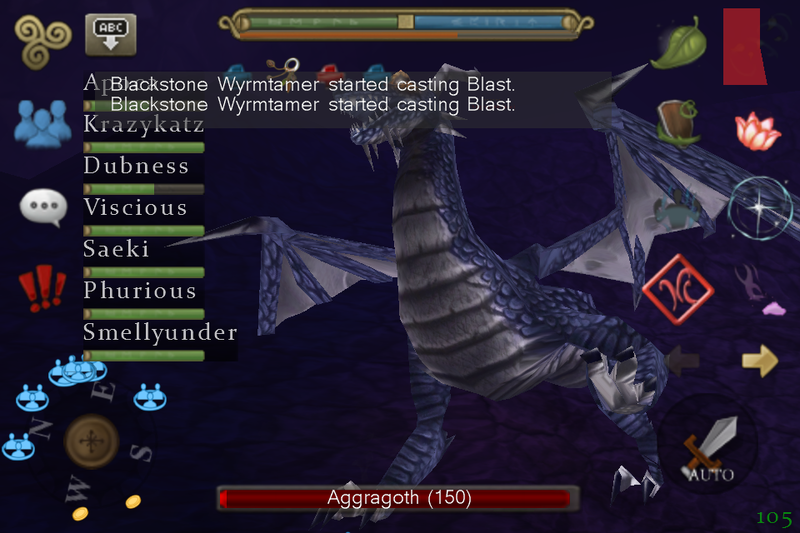 Along with the Aggy agreement, BadaBing and Uskoci needed to find a way to share Aggragoth's cave, because this was the only place to level up as a player approached the level cap. BadaBing would tend to level in smaller groups of two or three, while Uskoci had many members that needed to level and would level in groups of five to seven. This would push BadaBing out of the cave causing tensions to run high. The clan leaders agreed to share the cave, and when both clans were in the cave each would stay to their own side of an imaginary line running down the middle of the cave East to West. However, this agreement was broken many times by both sides. One leveling group that continually was the focus of this was KrazyKatz and Apoca. 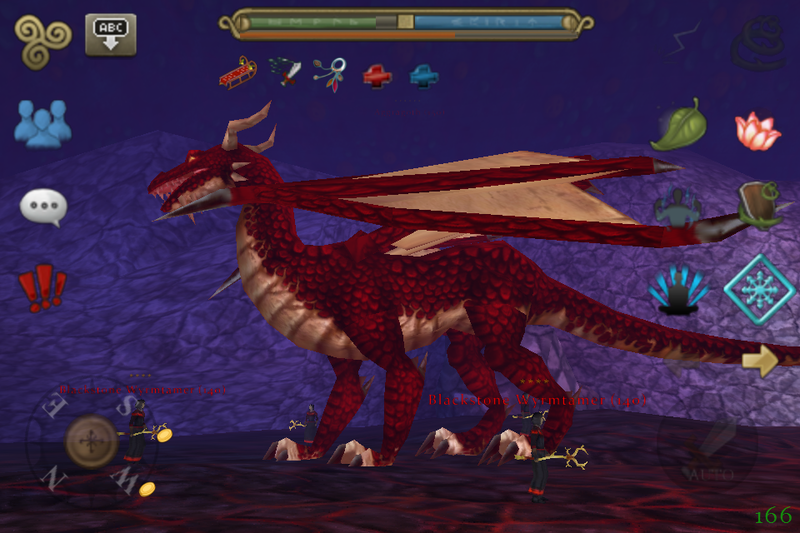 The two would grind levels on the wyverns in front of Aggragoth together frequently. This was the only spot to level up when a character approached level 150, so the time was at a premium. The two would become embroiled in drama about the sharing agreement in this cave. There was also drama within BadaBing, as they would cross the line against their own clan mates. The tensions went further than any of us knew. One day. Apoca logged on and started bashing KrazyKatz in clan chat, calling her all sorts of foul names and making accusations. Apoca was kicked from the clan until we could figure out what was going on. He would then log onto the clan communication app, Glassboard, and continued the verbal assault on her and all of the people in BadaBing. He would be kicked from every board, but come back due to the invitation link not being changed. After we ensured that he was blocked out, a new account created a post on the Celtic Heroes forum in the Arawn section. The person claimed to be Apocas wife, and related the story that Apoca and KrazyKatz had been engaged in a romantic relationship online. The post was deleted by the forum moderators shortly after that. In the coming days and months it would come out that Apoca was in the process of arranging an international flight to go and see KrazyKatz in person, but that fell through when she cancelled on him. People would briefly see Apoca online in the months after this event. He said he was trying to kick the habit of logging into Celtic Heroes for the sake of his marriage. Sometimes we would see him log in shouting insults at everyone who plays Celtic Heroes. In the end, he was not able to save his marriage, and ended up moving across the country to a new job. Apoca did not log in again. The Arena also ratcheted up the tension further, as former BadaBing member turned Uskoci member DeathsBank killed Phurious in the arena. Phurious demanded that Uskoci kick DeathsBank from their clan, and Uskoci declined. This led to BadaBing killing all Uskoci who stepped into the arena, denying them their daily XP quest. Near the end of Phurious' time as chief, a splinter group broke off from BadaBing named RedDawn, created by former BadaBing member Viscious. It started out as just Viscious wanting to be alone for a while in his own clan because he disagreed with decisions made by BadaBing's leaders. But people kept asking to join his clan, and over time he built up a sizable faction that was a threat to BadaBing. The animosity between these two clans was stoked by certain Uskoci members goading on the feud. The largest, and final issue happened in January 2013 when RedDawn was included in an Aggragoth fight, and it was rumored that their clanmate DeathsBank was immediately trying to sell the Godly Light Heal Ring he received. This made BadaBing members mad, so the Generals of BadaBing and Uskoci spoke and decied to exclude RedDawn from participating in Aggragoth battles. When that decision was enforced, RedDawn took to the forums to protest it. At this point, leaders of Uskoci pretended that the discussion about RedDawn never happened, laying the blame solely on BadaBing. With BadaBing and RedDawn at each other's throats, Uskoci could focus on bosses while the two clans focused on each other. Using his connections in both clans, Goodies of BadaBing was able to speak to both sides, to forge an alliance and stop the war between the clans. Bringing Viscious and Phurious together, he was able to create an alliance bringing RedDawn back into BadaBing and merging the two clans. 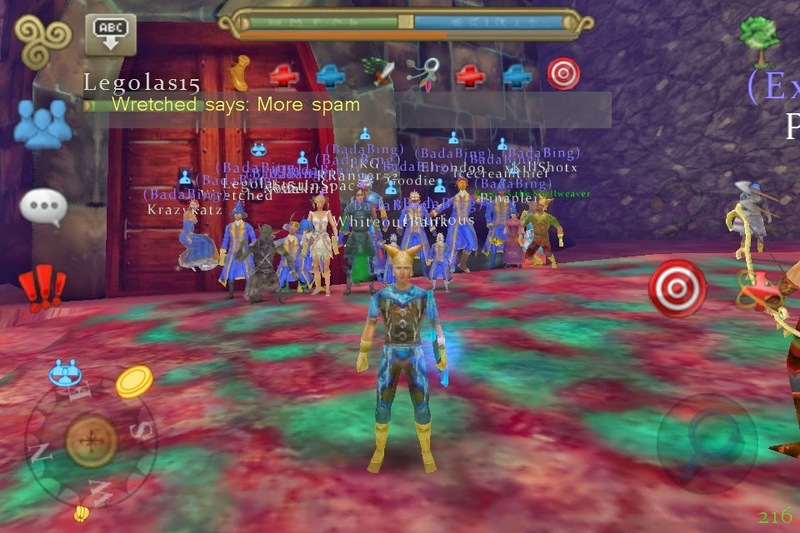 Situations like this, arguments over Aggragoth and his cave, and other issues led many in BadaBing, including Phurious, wanting to cancel the agreement to make Aggy a free-for-all (FFA) kill, stealing it from Uskoci. At one Uskoci Aggy battle, at Phurious' direction BadaBing lined up to steal it from Uskoci. There was a heated discussion in BadaBing clan chat and in whispers whether they should be doing this. The concern was that many didn't want the drama of battling over Aggy every time, especially when BadaBing wasn't confident they could win every time due to Uskoci's superior numbers. While some BadaBing attacked, others sat to the side and watched, while others logged out in protest. Uskoci won the Aggy battle, which caused BadaBing to rethink their course of action. This created a split in BadaBing, which caused Phurious to step down and give the chieftain role to Goodies on March 20, 2013. During his time as chief Goodies fought to keep the Aggy agreement in place, and to fight the negative stereotype that had been forced upon BadaBing. As chief, Goodies also fought against Uskoci trying to steal BadaBing members to their clan. He also tried to keep BadaBing motivated and generate a more positive image for the clan by hosting events such as lotteries, scavenger hunts, and an Easter egg hunt. Another change was that BadaBing increased their recruiting by implementing their feeder clan BadaRTC. It was at this time that Uskoci merged with Braves by including them on Aggy fights, and giving drops to their leaders ASHLYNN and BadMofo. Although Uskoci took most of the lower level Braves members, BadaBing was able to recruit their few high level members who were not happy about the merger. Among these people were Bellatrix and Asceliral, who would play a major role in the fate of BadaBing in Update 4. When Aggragoth was first introduced, he was red! During Smelly's time as BadaBing chief, Model led a small group of members to break away to form a clan named Power. It lasted 2 days before failing. BadaBing's second kill of Aggragoth only had one group, and lasted 3 hours! 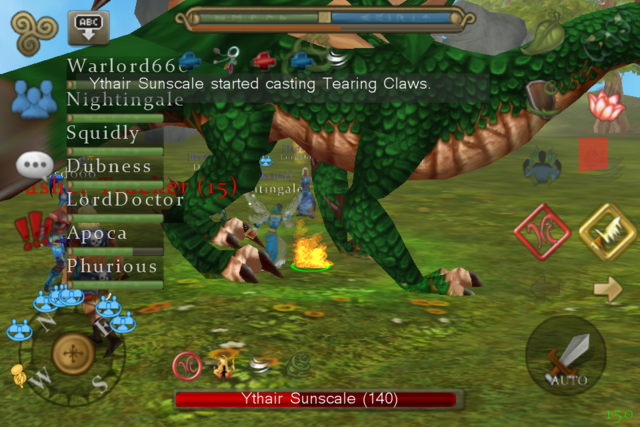 During update 3, only the Arawn server glitched so that no monsters could hurt you, and you couldn't hurt any monsters. It was the perfect opportunity to train abilities! It took OTM an entire day to fix it. Viscious was the first person to level all 5 classes to the level cap at that time of 150. He also pioneered the controversial "hand-to-hand mage" build. Phurious was convinced by Goodies to join BadaBing, because they were leveling buddies through most of the Otherworld. Tensions between Uskoci and Asceliral began when he was using firestorm on Uskoci members in the arena the night before the update, to provoke a clan fight.